Daniel was diagnosed with Leukaemia in 1993 at the age of six and was put on a 2 year course of chemotherapy which he completed in March 1995. But after being in remission for just 9 months, he relapsed in December 1995, when a routine blood test revealed leukaemia cells again. With no assurance that a second course of chemotherapy would be successful his mother, Beverley De Gale, sought a bone marrow transplant for Daniel. Daniel’s chances of finding a match within the UK were as low as 1 in 250,000 as there were only 550 African, African Caribbean, and people of mixed parentage on the UK register. Beverley and her partner, Orin Lewis, set up the African-Caribbean Leukaemia Trust to raise awareness, and to support and assist Black and Mixed Parentage people suffering with Leukaemia and all other blood related cancers. The charity also became involved with recruiting potential donors from many influential organisations such as the Fire Brigade, the Black Police Association, colleges and universities. 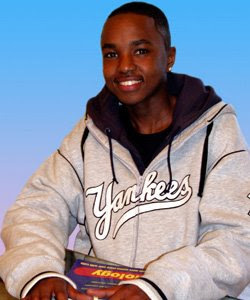 In 1999, after six years of treatment, a matching donor was found (Doreene Carney from Detroit, Michigan, U.S.A), making Daniel the first black person in the UK to receive a bone marrow transplant from an unrelated donor. Daniel died from an illness unrelated to cancer. Now I've never met Daniel but his untimely demise rocked me to the core. The De Gale family through their African Caribbean Leukaemia trust have worked tirelessly to increase the number of bone marrow donors as well raise the awareness of the disease to the masses. Daniel was our success story. He was a handsome, articulate and well mannered young man who had his whole future ahead of him. I know it's sounds childish of me, but his death just doesn't seem fair. Not when so many of his peers are walking around aimlessly, recklessly throwing away their lives and taking those of others, as if life were a pair of tatty old shoes that can easily be replaced. It can't. Daniel's death reminds us once again that it's a temporary gift that we will all have to return at some point. I never figured I'd ever have the need to quote Rihanna, but in the words of the Bajan beauty "So Live your Life". NOTE: The work of the ACLT still continues, so if you haven't registered to become a bone marrow donor please visit www.aclt.org for further information on how to do so. That would be the greatest gift you could give Daniel and the De Gale family right now. I could not believe this when I heard it. What a shock, I did not even know that he was ill. He seemed like such a lovely boy, may he rest in peace. My heart goes out to his family. I didn't know he was ill either, just goes to show. He seemed like a lovely lad, such a shame. X-Factor: So how do you think they're doing? How do we solve a problem like the Mobos? Who will be crowned the black beauty of Britain? Who has the X-Factor this year?